This month I had Cook With Sarah as my assigned blogger. She has so many recipes I spent forever looking through them all! I know we were supposed to do something related to the holidays for this reveal, so I found a red, green and while recipe to satisfy my salt tooth. I chose to make her Roasted Red Pepper & Artichoke Tapenade. I have made olive tapenade before, but never artichoke. I added a little extra olive oil and parmesan to the original recipe to tone down the salty overtones in the recipe. I also used a little less cilantro than called for, simply personal preference. I then decided to make crostini with the tapenade, topped with shrimp. It can be served warm or cold. Personally, I like it better warm; plus warm is good for cold days. The festive colors make this recipe great for a holiday appetizer. Combine all ingredients, except shrimp and bread, in a food processor and pulse until desired consistency is reached. Let tapenade sit in refrigerator for 1 to 2 hours. 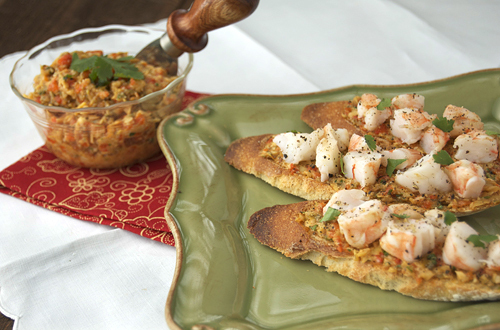 Toast the crostini, spread a layer of tapenade and stop with chopped shrimp. Garnish with black pepper and minced cilantro to serve. Optional: Warm in 350F oven for 2-3 minutes before serving, for a warm appetizer. Great SRC pick! This looks really good! What a beautiful presentation for your Shrimp Crostini with Artichoke Tapenade, just in time for holiday entertaining. It is fun cooking with you at the SRC, have a great day! Oooh, what a fantastic idea! I love the artichoke/shrimp combo so I know I would dig this! I love crostini. So simple yet so delicious, and I LOVE the flavors in here! I’ve been looking for an appetizer to make for a holiday party I’m going to this week and this is perfect! Thank you! We just (reluctantly) got back from Hawaii. Have a great trip! I’m so glad you enjoyed this! I loved using this as a sandwich spread when I made it, and your idea is perfect! I will have to try this! SRC is so fun because other people can oftentimes improve on an already great recipe! Those sounds wonderful, especially when so many people are posting sugary sweets. The shrimp crostini looks to die for. Love crostini – you can do so much. Great idea with the shrimp! I’m always looking for new appetizers and this one looks perfect for the holidays! yum! I love anything shrimp and this looks fabulous. Will try it out soon! I never make tapenade but then it is spread on a crostini or panini and I am remind how much delicious flavor they add. This looks like a perfect holiday appetizer. I absolutely LOVE this recipe!!! Artichoke tapenade is amazing and it’s perfect to serve guests this holiday season! WOW! 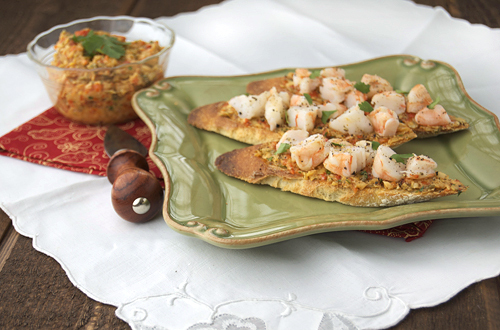 These have *everything* I love – crispy bread, shrimp, capers *and* artichoke hearts! So on my to do list 🙂 Great recipe, and great post! Pinning this on Pintrest! Love! Great pick! The combination of tapenade and shrimp sounds fabulous, and so perfect for holiday party season… I bet these would be the first thing to disappear from the table at a party. I love the sound of that tapenade. These would definitely make great Christmas party snacks too. Amazing SRC post…I could eat this for my dinner!!!! YUM. this looks great! oh im so hungry now!